"A journey is a person in itself; no two are alike." John Steinbeck says that in Travels with Charley in Search of America. I first read the book back in 1962 and was re-reading it for my book club during the trip to Ocean Shores. 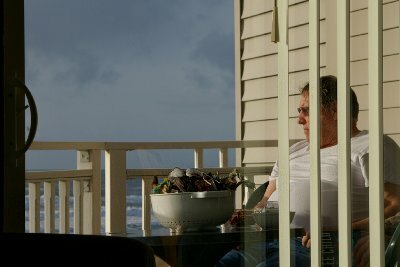 I've visited Ocean Shores many times during my life: sometimes with friends; sometimes with my best friend and wife, Peggy; and once just by myself. 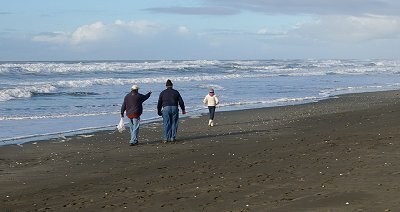 This journey was the second time the same basic group of friends traveled to Ocean Shores in December. We had a great time and did some of the same things we did a year earlier, but, Steinbeck was right. The adventure was the same, and yet, different. Peg and I joined up with friends Donn and Debbie Irwin at the University Place home of Rob and Vickie Erb. We parked our car and then added our suitcase, the laundry bag which contains my pillow and Peg's pillow, our bags of books and art supplies, and a plastic milk crate with cheddar cheese with a box of really good crackers and two bottles of St. Brendan's Irish Cream to the already full wayback of their Ford Explorer. 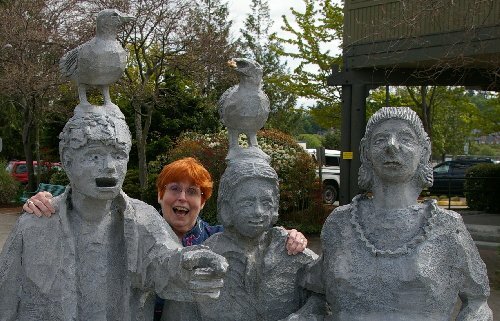 We caravanned from the Tacoma area to Ocean Shores with only one stop at the Wishkah Mall in Aberdeen, were we bought a few more supplies at Wal-Mart and grabbed some lunch at the abbreviated McDonald's inside the department store. The young man at the counter asked if I wanted their new Holiday Pie, but I declined. As I stood and waited for Rob as he ordered, I looked over the lighted menu and saw the Holiday Pie. I asked, "What's in the Holiday Pie?" The answer was, "Custard." I ordered the two-for-a-buck little delights. I ate one and offered the second up for sampling. There were no takers. I finished off the second one, too. 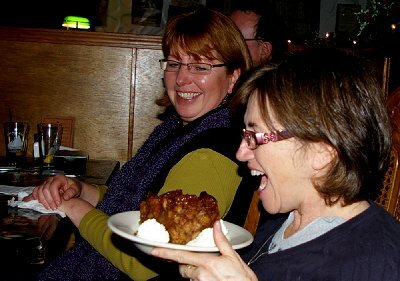 The Holiday Pie became a little joke with us for the entire weekend: a cacophony of laughs for a dollar? Now, that's a deal. Our two car caravan arrived in Ocean Shores too early to check in, so while the women sat to talk and read, the men played several games of pool. There was no bragging or posturing. None of us had played in years. (Given the lack of recent experience, there couldn't have been any bragging.) The fact that there was no chalk for our pool cues didn't really help, or hinder, but I would like to point out that Rob lost every game. That's just good reporting. When the rooms were ready for us to move into, we began the trips up and down the stairs and elevator to the condos of Mariner Village. The Erb baggage and almost all of the food supplies went to 402, while I took the Doman luggage to the condo right below in 302. Since I was the first to arrive in 302, like a true explorer, I claimed the master suite with its king-size bed and large two-person shower for Peg and me. Did I mention there was also a flat screen TV and DVD player in the bedroom? I left Donn and Debbie the smaller bedroom with twin beds, no bath and no TV. Deb never complained. She is so kind. I just love her. Donn mentioned the disparity of the rooms several times. But then, who listens to bellyaching? We have to move on . . . after a nice shower in the master bath of course. After unpacking, Peg and I read and relaxed on our king-size bed. I eventually drifted off for a nap and awoke ready for an evening's adventure. While I slept we were joined by Rob's brother Paige and his wife Jan. They bunked with Rob and Vickie. I'm sure they were assigned the smaller bedroom, but I never heard them complain. They arrived a little earlier than expected. Paige had mentioned a week earlier that he wanted to take some photographs along the way. The weather didn't cooperate, which isn't unusual in the Pacific Northwest. The forecast for the entire weekend wasn't very good. Weather reports talked about a huge storm off the Washington Coast (that would be where we were), which would be moving inland bringing tons of rain and flood warnings. None of us live near a Washington river, so we didn't worry too much. Plus, the storm had been off the coast for a couple of days already. In scouting out the entertainment for our trip I found that the Quinault Resort and Casino had a special early-bird dinner menu for $4.95. The price was right. Our four couples zeroed in on the cheap eats. We placed our dinner orders with Regina, a nice waitress who had set up a special table for us. I think the staff thought it would be nice if we had our own dining room, but the ambiance was a little lost with the prepping and staging area for silverware, glasses and ice water for the other guests. Also, the senior citizen walker stowed in our dining room for storage during another patron's meal only added to the decor. The food wasn't bad. Peg's salmon was a little over-done. 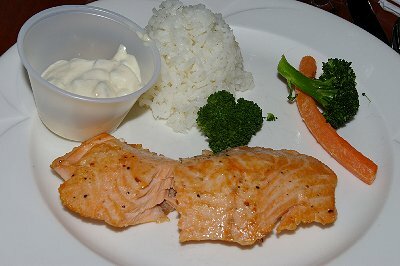 Since the meals consisted of small entree portions, I chose the steak AND the salmon. My steak was a little over-done from the medium-rare I ordered, but the salmon was good. The waitress mentioned a brand new dessert menu. Peg and I shared the chocolate mocha cupcakes with chocolate mousse. Deb ordered the same. Vickie opted for the creme brulee. The reviews were less than mixed. Rob said he enjoyed Vickie's creme brulee, but she did not. The cupcakes received the same comments from Deb, Peg and me. They were dry and crumbly. For the eight dollars I paid for the two miniscule cupcakes I could have had sixteen Holiday Pies. The pies would have been sixteen times better. The casino restaurant should have been embarrassed to even list the cupcakes, much less sell them at such a price. Ridiculous. Days before I had suggested the casino for their Friday night $24.95 seafood buffet. That came off our itinerary completely. We took the rest of the evening off (after a late evening round of root beer floats made with Rocky Road ice cream and a couple squirts of Hershey's chocolate sauce) and prepared for a full Friday. While we were preparing our floats the condo office rang room 402. I answered, "Talk to me." The receptionist laughed and said, "I guess the party is in 402 tonight?" She was calling to make sure we were happy and settled in. We were until Donn needed late evening popcorn. Our microwave wasn't working. Don, the maintenance man, stopped in to give us instructions and then left and returned with one that worked. "I took it from the breakroom," he explained. Our friends Mike Mowat and Jan Runbeck, whom we have dubbed the "Mobecks," had a full day on Thursday and decided to wait until Friday morning to drive to the coast. They actually slept in (to 7 a.m.) and then started their journey. 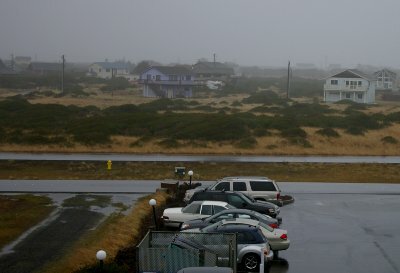 After discussing the possibilities, the rest of us occupying condos in Ocean Shores headed out to the Pirates Cove for breakfast. By cell phone we kept track of the Mobeck progress, while we had a great time. The Amici Cafe was on our list for breakfast sometime during our trip as was the Ocean Crest Resort in the town of Moclips (about twenty-five miles up the coast). For Friday, The Pirates Cove was an excellent choice. We all found one or two items we loved. Christina, the waitress at the Pirates Cove, joked and teased us and made breakfast recommendations. She was quick with sarcasm and a ready smile. She said she was the cook and would be happy to prepare our food just how we wanted it. I think she lied, but the food was cooked perfectly. Christina singled out Rob and gave him a hard time, which we all appreciated. Starting off the day with hearty laughter is truly a blessing. The whole day glows. If we had been charged by how much fun we had at the Pirates Cove, we couldn't have afforded it. Christina was wonderful. 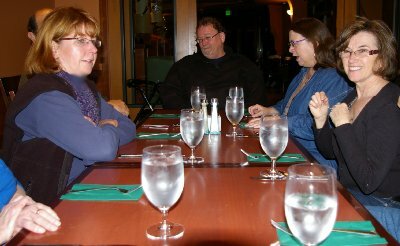 I think our eight-person gathering was pretty much the entire multitude of diners except for an Ocean Shores policeman. Donn pointed out that the officer of the law was wearing two guns: one slung half-way down his thigh and the other closer to his belt. I asked Donn if he had looked for an ankle holster sheathing another gun. He hadn't but remarked if he were a police officer he would be packing about five of them. 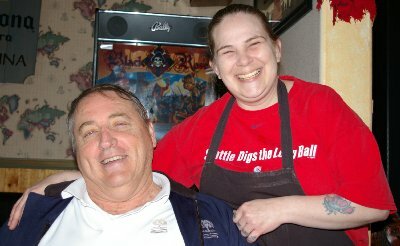 Christina told us her father had helped install the entire water system of Ocean Shores. He always advised not to drink it. It's not as good as Tacoma's water, but the coffee was okay and no one got sick, so there you go. Christina's daughter lives in Hoqium, which is a pass-through to get to Ocean Shores. I'm supposed to send her a message on Facebook so she can see her mom on the net. Christina recommended the sausage. She said we would like it. She was correct. A side of sausage was three large links. They were served with my side of bacon. 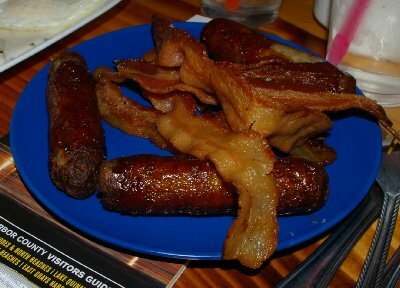 Both sausage and bacon were excellent. Anyone who had the sausage raved about it. 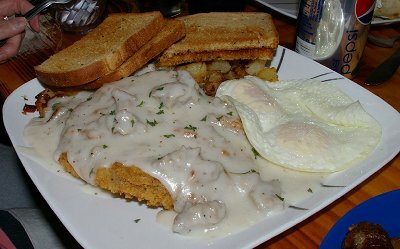 I had also ordered biscuits and gravy, while Peg ordered the chicken fried steak. Next time I think I'll just eat half of Peg's steak and share the sausage and bacon with her. I hardly ever eat biscuits and gravy in a restaurant. I usually ask to substitute sourdough toast for the biscuits and I followed my usual program. Restaurant biscuits almost always pale in comparison to homemade biscuits from a Doman. Peg's are great, mine are great (and much bigger than Peg's) and son Del's are great. I think Patrick makes good biscuits, too, and I know he bakes good bread. I don't know about daughter Andrea's biscuits, but I know her rag-muffins are excellent and they begin with sweetened biscuit dough. Restaurant biscuits never taste homemade even when they are. Good gravy is another item hard to come by. The Pirates Cove gravy was okay, the toast was okay, the home-style potatoes were okay, but okay is not what I look for dining out. I always go with the items that sing. Sometimes I just forget the tune. The Pirate's Cove had plenty of tunes, but I will need to remember just the top ten. The eggs looked perfect. The home fries, cooked potatoes, were cooked to order, but I prefer hashbrowns. I know; it's hard being me. We had a great time at the Cove. The waitress was fun, the food was good, and the fun objects around the restaurant gave us our own playground of opportunities. 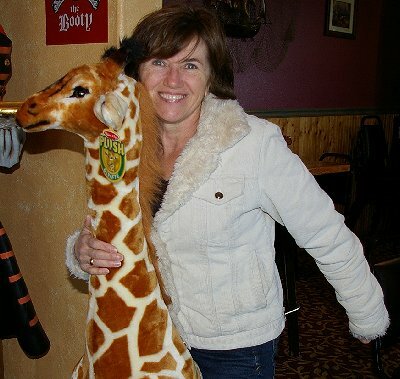 Vickie rode the stuffed giraffe. She was so cute and she used a make-believe riding crop on its backside. 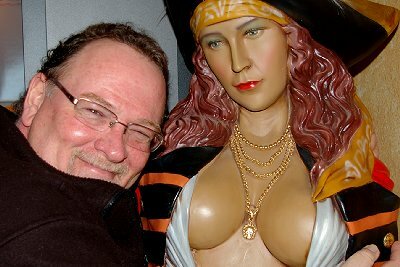 In private Vickie complained to Peg that I had not taken any photographs of the women with the hunky pirate by the front door, like I had with Paige and the pirate girl, but if she had ridden him, I would have gladly taken her photograph. Ridden the pirate that is, not Paige. Okay, both. By phone Donn talked once more with Mike and Jan, who by the end of breakfast were drawing near. 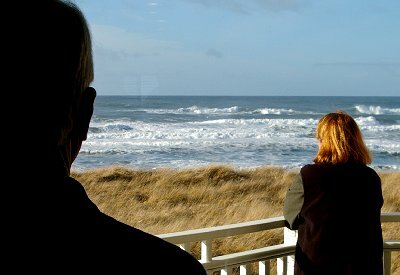 Mike mentioned that they had just seen the sign for Raymond (about fifty miles south of Ocean Shores) and the waitress started to give directions from across the room. Mike was only joking. They missed our hi-jinks and were waiting for us in the parking lot of the condo when we drove in. The Mobecks joined us in room 302. Being last, they got the Murphy bed in the living room. The message is clear. Be first or you don't even get a bedroom. Arrive last and you get the fold-down. Jan and Mike did get a nice view of the ocean from their bed, however. Friday turned out to be a beautiful day. The storm held off. Most of the group went for a walk on the beach. For Rob and Donn this was a chance to indulge. 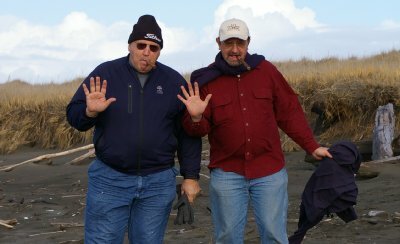 They lit up and enjoyed cigars during their seaside ramble. Although the sky was blue, it's always a little windy and cool on the beach. Bundling up is a must. Peg and I stayed bundled up AND stayed back in the condo. I read a few more chapters of Travels with Charley. With almost every page I was astonished at the writing. It was like reading my own philosophy and the story of my life. I knew that one of my favorite quotations was from the book ("A sad soul can kill you quicker, far quicker, than a germ. "), but I wasn't expecting the number of parallels. For example, Steinbeck mentions getting lost in Chicago and simply hiring a taxi and following it to the hotel he was seeking. I suggested the same thing when our group was driving around near Venice looking for our hotel. I thought I came up with the idea on my own. We truly build on the ideas of those who have gone before us. 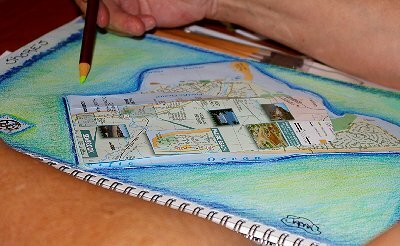 While I read and took notes, the rest of our travelers were collecting flotsam (natural items from nature) and jetsam (man-made items that have either been discarded or lost overboard) from the beach. I think they did their beach combing for hours. The beach explorers returned with bags of items. 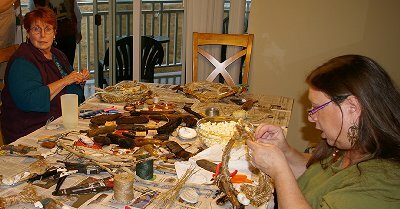 The shells, floats, nets, pretty stones and driftwood were to become the fodder of artwork on Saturday. When the ocean retreated it left behind tons of good stuff that would stimulate the creativity of the five wonderful women in our group. Even though the group was limited to size restrictions for their art, their treasures were more wonderful than pirate gold, if not pirate sausage . . . and bacon. Back at the condo, the beach collection was cleaned up a bit and put into a large bowl which then sat on the green plastic table on the deck to air out and dry, where the sun shone warmly. The sheltering wall stopped a bit of the wind and two of the boys stripped down to tee-shirts and enjoyed the view while drinking Scotch, smoking another cigar, and doing mostly nothing constructive. That's not a bad thing. At times I prize doing nothing, but it's usually while someone else is doing something that needs to be done. Now, that's something to savor and appreciate. Relaxing and letting the mind wander can be productive, but I find it works best to let the mind unwind by itself. Telling it to come up with a new idea or thought just doesn't work. By letting the mind mull things over it sometimes will surprise me with a gift of insight. Not on this trip, perhaps, but sometimes. Actually, doing nothing doesn't really describe the activity well. I never tire of watching the sea. From our condo we could see the jetty just a few hundred yards south of us and the long grass of the dunes that separated the lawn of the condo from the beach. Paths access the beach though the dunes and the tall grass. Usually in summer you can watch the grass as it moves in the wind. The grass wasn't moving much during this trip. It must have been weighed down with moisture. The small scrub pines that bordered the lawn on the edge of the dunes moved with the gusts, but not the grass. I studied this for hours. At home I often wake up about 4:00 a.m., which is too early to roll out of bed, even for me. When this happens I turn on the TV and check out the movies. Quite often films begin at four. I have discovered many favorites during this time slot. If they pique my interest I record them. If I really, really like them I purchase the DVD. For this Ocean Shores trip I brought along five favorite films. Four of them fell into the four a.m. category. The latest one was Entry Level starring D.B. Sweeney. I first noticed Sweeney in the mini-TV series Lonesome Dove, playing the lovesick cowpuncher, "Dish." I have since seen him as an ex-hockey player in The Cutting Edge and heard him as Sitka in Brother Bear (one of Donn's favorite movies). In Entry Level Sweeney plays a chef who looses his restaurant and has to re-enter the job market with a listing of "no skills." There were some great lines in the film and some great actors. I purchased two DVDs to give away as Christmas gifts. Everyone settled down after their walk on the beach and then, after staring at the ocean and blue skies, we watched the film together. It seemed like everyone appreciated the humor of the film as much as Peg and I did. Great minds think alike. After the movie, the women worked in the sketchbooks Peg brought and inscribed. They made collages of the ephemera (the flotsam and jetsam of the paper world) found in the hotel and other places in Ocean Shores. Experimenting with design, shapes, color, texture and gluing, they had a real kindergarten experience much enjoyed by the participants. 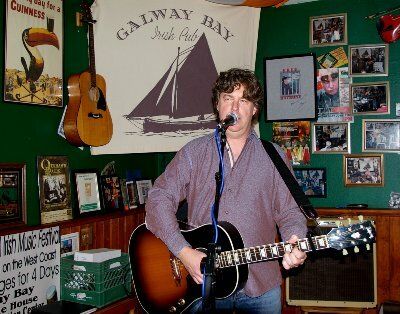 For dinner and entertainment we headed out to the Galway Bay. The Irish pub usually has live entertainment on Friday and Saturday nights. We figured we'd get there early to dine and then enjoy the music of Cronin Tierney. The evening stumbled a little bit when the waitress began by seating us at the back of the room. I didn't realize that Debbie had already said that the placement was fine. I objected and requested tables closer to the stage. The waitress came up with reasons why she couldn't sit us nearer and I came up with reason why she should. "We tip well," didn't seem to interest her. That the tables were for couples didn't interest me. Mike put his oar in the water with "We're five couples." Mike used to own his own restaurant, so he knows full well the benefit of small tables: they can easily be moved to form larger configurations. While I was fuming, a couple came in and sat at one of the three tables I wanted to move to. We began placing our orders. I asked about the Catch of the Day Special and was told that was no longer available. In my pissy mood I had not heard Peg ask the same thing. She ordered the seafood pasty and the sausage roll. I ordered the fried oyster appetizer and a corned beef sandwich. The waitress Mariah partially redeemed herself by getting the sausage roll for Peg. It's available only as a dinner entree or as a breakfast side item. Sausage roll is a bit of a misnomer. The sausage rolls I've had from my favorite Brit, Andi Melquist, are always one whole sausage link with a surrounding crust. 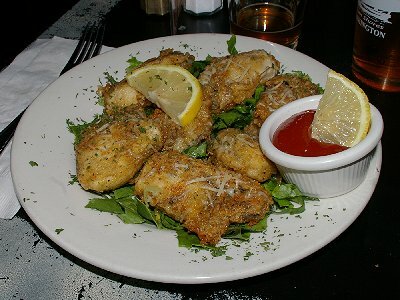 At Galway Bay they are two slices cut from a much larger roll, surrounded with puff pastry and brown gravy poured over. Everyone enjoyed their dinner. I sampled Peg's sausage roll and gave her some of my oysters, which were cooked "just right." I only had one bite of the corned beef (too much food.) Peg shared her dinner salad with me. The raspberry vinaigrette was very tasty as was their soda bread, which I always love. Next time I'll order oysters and the sausage roll and be done with it. 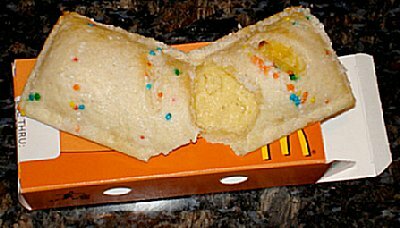 I ate Peg's leftover roll on Sunday morning. Yummy. The entertainment began about five minutes late, to accommodate the singer getting a glass of whiskey from the bar. Cronin Tierney was a strange mix of Irish and . . . I'm not sure. He accompanied himself on guitar and then set the guitar down and played the piano. What was strange was that his voice changed when he changed instruments. It was like he was trying to channel Van Morrison when he was playing the piano. I didn't appreciate his version of Danny Boy. He had pauses in-between his numbers and his stories sometimes had no point, but still Peg and I appreciated his efforts. Peg dropped ten dollars in his guitar case and bought one of his CDs for fifteen. We support live music. I think Tierney plays a circuit of Irish bars from Portland to Seattle. I'm guessing he would do better with a larger crowd or at least one that sat closer to the stage. If we were closer I would have made requests. No one ever came in to sit at the other empty tables. Our ten people were the bulk of the audience. Mariah scored a lower price for a bread pudding dessert. She got us a smaller piece, which was excellent, but still more than we could wolf down. Vickie had one forkful and loved the sauce, but it is so rich that one was enough for her. I think the pudding came home with Donn, but I don't know that it was eaten. We had plenty of food to choose from, no matter where we were. As I always say, "You are where you eat." Mike drank a Guinness that was a dark chocolate liquid with a tan, foamy top. Later he switched to Scotch with Donn and Jan. Peg had tea. I went from a Pale Ale to hard cider. I wish I had asked for ice with my cider, but didn't want to seem like an unappreciative American peasant. Three of the non-Tacoma-party couples left after Tierney's first set and two other couples stayed for the second set. I listened to the CD on the DVD player in our bedroom later. Unfortunately, Danny Boy was one of the selections. Saturday was cooking day for us. Donn, with help from Debbie and probably everyone from our group, made sourdough French toast, sausage links, pepper bacon, fried eggs, and sliced apples. 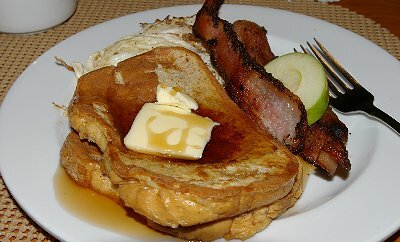 Served with butter and Mrs. Butterworth's syrup and accompanied by orange juice, coffee, milk, Pepsi, and coffee with Irish Cream, the meal held me well until sandwiches in the early afternoon. Dinner was lasagna. Peg called me on the phone after dinner. I had skipped the evening meal. I can only eat so much. Yeah, right. Since we knew we didn't want to transport more than we had to and knew that we were going to have cinnamon rolls and oatmeal on Sunday morning, we had to finish off the eggs. There were thirteen left after the French toast, and as luck would have it, there were thirteen requests for fried eggs. The pepper bacon was excellent. The pepper gives it a little extra bite. I used to find myself in Centralia about once a week and I had a favorite butcher shop where I would buy pepper bacon and applesauce sausage link. I would buy for me and friends; however, I would only eat for myself. 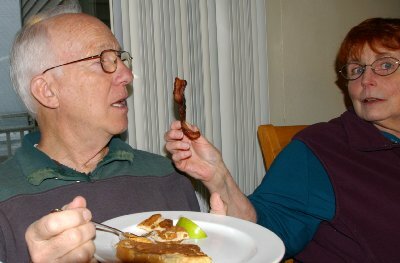 Mike appreciates good bacon. He knows that breakfast is the most important meal, but even so, Jan is usually near by to stop the bacon flow. Saturday, Peg was nearby and to hand feed him. He was a good boy, as was I, but I would have liked a few more pieces. We soaked the pans after breakfast and later that afternoon I washed them with a Scotchbrite scrubber. It was like paying for my sins. I would have paid more for a couple extra pieces of pepper bacon. The afternoon was taken up with art. 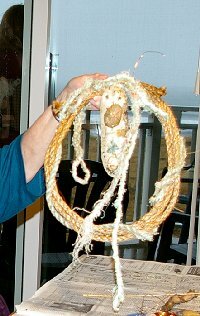 Debbie purchased thick rope at the hardware store, cut the pieces to a triple wrap length and brought along pruning shears, wire, twine and a hot glue gun. With the rope loops wound up with wire and twine, the adornments were secured with the hot glue. (Ouch, I touched it again!) The women constructed rope wreaths decorated with the flotsam and jetsam collected on the Ocean Shores beach on Friday. All the women created very nice art pieces that represent a fun and memorable weekend. 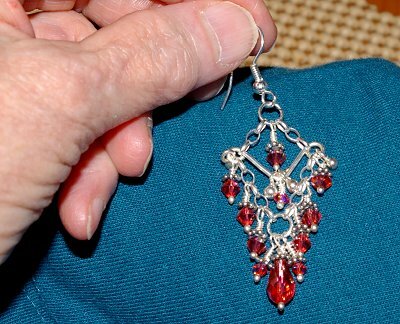 Continuing the art journey, Jan Erb shared the history of her increasingly complex beading projects, the design decisions she made as she progressed, and the much appreciated leadership of the talented instructors she'd had. Jan also kindly fixed Peg's ruby heart necklace chain that had fallen apart. Peg appreciated this because she's been wearing it everyday for months since Don gave it to her. It was good timing on our part. The weather was not friendly on Saturday. I went outside early and was greeted by howling winds tons of mist and water running down the condo exterior walls; however, that turned out to be a pressure washer. It was raining, though, and the wind was blowing. All of the women created some very nice pieces of art that will represent a fun weekend in our memories. As the art work was completed we watched another video, Saint Ralph. Three couples had seen this one before. This was another movie I'd seen on early morning TV, purchased on DVD, and loaned to Donn and Debbie. I think Rob and Vickie even bought their own copy as well. Jan and Mike were anxious to see it. It was a nice addition to the trip. It mixes teenage angst, young lust, and faith. Saint Ralph, an apparent inspirational puff piece with a quirky sense of humor that translates into wicked absurdity, has been the beneficiary of a long series of happy accidents. 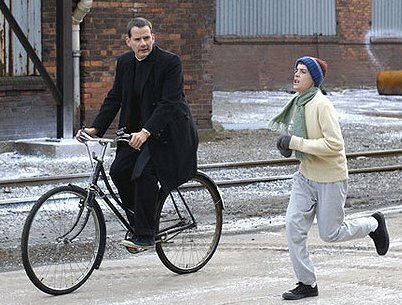 From having good luck with a teenage actor (relative newcomer Adam Butcher) in a lead role to having a prior connection to another star (noted Canadian actor Gordon Pinsent, who had done a public reading of one of the Canadian-born Michael McGowan's scripts years before) to being able to fake vintage running shoes by dyeing and modifying bowling shoes, the film seemed to lead an awkwardly charmed life, in keeping with its story about a boy in search of a miracle. The miracle, in fact, was the basis of the story from the start. "It was kind of a ridiculous notion," McGowan says, describing a 14-year-old training to win the Boston Marathon. For that reason, he chose to set the film in a Canadian Catholic school during the 1950s, in keeping with the history of the Catholic Church in McGowan's native country. "If he needs a miracle, what kind of world would he live in?," McGowan wondered. His Catholic upbringing sprang easily to mind. The Catholic Church was extremely powerful in the '50s, he notes, giving Ralph's antagonist, the stern Father Fitzpatrick, an added weapon and further lengthening the odds that Ralph would succeed in his rebellion and run the race. "You're 14 years old," Fitzpatrick tells Ralph in an early scene, with an air of utter finality. "Greatness is not an option." By the late afternoon the rain hadn't let up. News reports mentioned mudslides blocking Amtrak about sixty miles south of us and flood warnings on the upper Puyallup River back home in Pierce County. 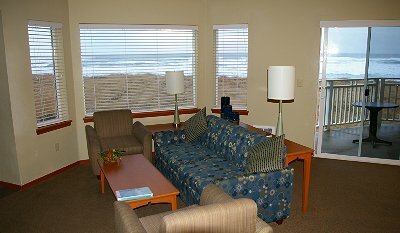 In Ocean Shores the wind blew and the rain beat against the windows. We just turned the audio up on the movie. Sunday morning we ate cinnamon rolls and oatmeal. Well, I just had the cinnamon rolls (2). Now, if the hot cereal had been grits or Cream of Wheat I would have had both, but oatmeal tastes like . . . oatmeal. As we checked out of the condos, Rob made a reservation for us all again for next year. We had a great time and the people there were so nice. In the rain and wind we packed up and headed back to the Tacoma area. We saw some flooded landscape, but nothing serious like houses standing in water. We had a great time and the trip had its own personality. The memories will keep us warm and dry for a while - all of us with smiles on our faces. Ocean Shores in December Again, ocean shores, galway bay irish pub, cronin tierney, quinault resort and casino, pirates cove restaurant ocean shores, ocean shores galway bay quinault resort casino washington wa.